This week (January 29th - February 4th) marks the third annual Physician Anesthesiologists Week. Join us and the ASA and use this week to advocate for patient-centered, physician-led care. Contact policymakers, engage with local media and on social media, and connect with colleagues, patient advocates, and the community. There has never been a more important time to advocate for the specialty of anesthesiology and your patients. 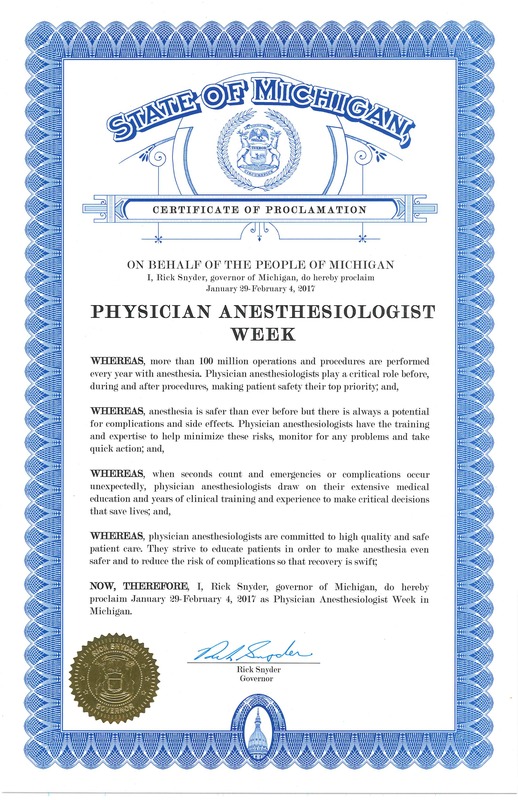 Again this year the Michigan Society of Anesthesiologists received a proclamation from Governor Snyder included below.